Posted on April 2, 2019 at 10:04 am. The PESO model will help all your media channels act as a single unit and work to strengthen each other. Paid media was the primary focus of advertising and marketing. Earned media was the primary focus of PR. Shared and owned media was the primary focus of –none of the above. This guide will cover the basics of the PESO model to help all your media channels act as a single unit and work to strengthen each other. Though paid media comes first in PESO, owned media comes first in the process (Gini Dietrich acknowledges that OESP isn’t a good term to brand this model). This is exactly what it mean, “the content your business owns.” Owned media is created specifically for your brand and published to your website or other owned channels. Blogs, news pages, eBooks, white papers and podcasts are considered owned media assets. 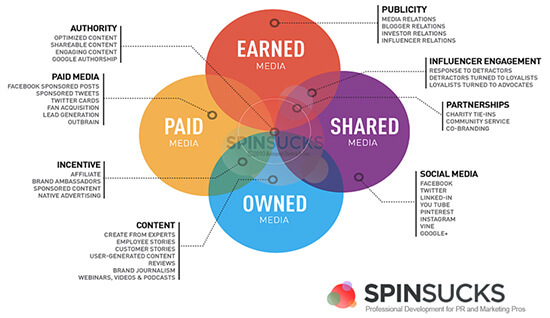 Aside from the cost of resources to create content, owned media is free. But depending on your organization’s goals and team size, content creation could be a budget buster. To build a library of owned content, investigate options such as hiring internally, recruiting freelancers, or working with an agency. Or develop a combination of the three. There’s no doubt that we love to create acronyms and memorable terms in this industry. This is probably why shared media was added, so we could say “PESO” instead of “PEO.” Regardless, shared media is a crucial addition and a component that hardly existed for brands a decade ago. The slightest mistake can turn into a viral post that could be damaging to your brand. Don’t make the mistake of posting a tweet that misuses a trending hashtag! This will prove that you probably didn’t do your research before clicking the “publish” button. MAT releases are still a tried-and-true content distribution method, used mainly to increase brand awareness. Unlike paying one fee to host content on a publisher’s website, you pay for a MAT release to be distributed through a vendor (like PRWeb), and the article is then placed within the publications in that vendor’s content distribution network. Editors can also choose content from brands to fill space when needed, which turns the MAT release into an earned media property as well. To further capitalize on this placement, you can share a published MAT release with your social media followers.